Kverkfjöll, a large stratovolcano is hidden beneath the NE end of the Vatnajökull glacier. It has two elliptical ice-filled calderas, 8 x 5 km in diameter. Fissures from the volcano can be traced 60 km to the NE. Kverkfjöll has had a number of subglacial eruptions in historic times. 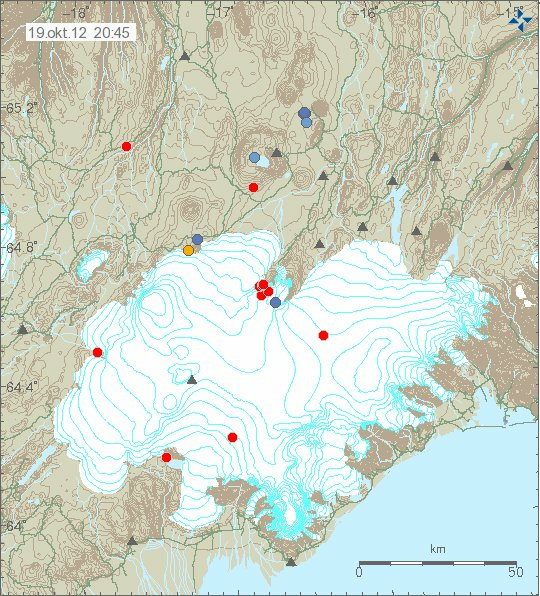 A small earthquake swarm occurred on Saturday at Kverkfjoell volcano with about 20 quakes. The largest was a magnitude 2.6 event at 1.1 km depth.